Iron Maiden is confirmed to play Stockholm‘s new National stadium, Friends Arena on July 13th 2013. Maiden is the first rock band to be announced for the 50.000 capacity venue, located at Solna. Dickinson explains that they’ve had the facilities in sight for a long time and is happy to finally be able to play there. 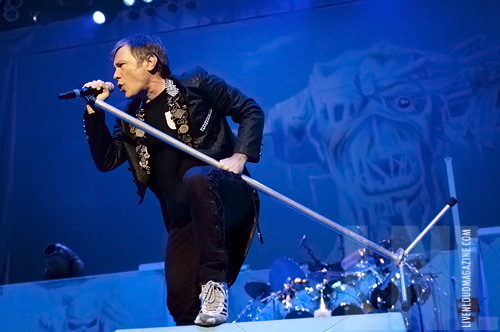 He adds that he believes 2013 will be Maiden’s biggest year ever in several parts of the world, and that the interest for the band is still on the rise everywhere. – We will carry on for a long time. We can still do incredible stuff with this band, Dickinson is quoted. – We will show up with a very expensive production, that’s for sure. It’s the show we brought to America with a twist. When asked about a new album, Dickinson swears to secrecy. – I can’t say anything about that, the only thing I can talk about now is the coming gig. ← Second part of Metal Hammer’s interview with Bruce up now!